** DOIT RECEVOIR DE PRIX ** Beau 4 BR Condo / Vue fantastique / Privé / Come See! Notre lotissement est idéalement situé dans la forêt nationale de White Mountain, un 2. 5 heures de route de Boston à l'ombre du mont Washington et de l'historique Mount Washington Hôtel. Si vous avez une question; nous serons heureux d'y répondre. This property is far more lovely than the pictures. Our family of four, plus two sets of grandparents stayed for two nights. The views are breathtaking and the space is well-maintained and exceptionally clean. The living space is very roomy-- plenty of square footage. We used all of the kitchen amenities for breakfasts and dinners-- we were pleased with the selection of pots, pans, dishes, and such. I wish there were more towels available (facecloths, and extra bath towels), but the washer/dryer was helpful. Manesh was timely and pleasurable to work with through the whole process. We would highly recommend this rental! This property is beautiful as advertised. Manesh was so helpful leading up to our stay and during. The condo was very clean and was perfect for 2 families, with a great area for kids on the lower level. The kitchen was very well appointed with all the cooking essentials, plus. The view was outstanding, with the slopes visible right out the family room window. The kids loved waking up in the morning to see if there was anyone out skiing yet. We can't wait for another stay at this beautiful condo! The condo was perfect. It was so clean and the kitchen was huge! There were 4 adults and 4 kids and we had more than enough room. The kitchen was well stocked with lots of pots, pans and silverware. The views were beautiful and would love to go back in the fall to do some hiking. Manesh was great, very responsive and welcoming. Actually sent me text the day of our arrival to make sure everything was in order and wishing us a nice stay. It was a great weekend and we will definitely be returning to this condo next year. Thanks Manesh! Had a great time staying at the condo. There were 6 of us total (4 adults & 2 kids) and we had more than enough room to relax and spread out. The place was very clean with all the at home essentials available (kitchen items, etc.). It is tastefully decorated and doesn't feel like a "rental" nor did it feel like we were invading on their personal items. As nice as the pictures are its even better in person. The kitchen is huge and the view is simply amazing. I found myself waking up early just to take in the view as each day started. Not having been to the area in several years Manesh took the extra time to not only go over the house but to also give us some ideas of what the area has to offer. His communication before, during (made sure everything was ok), and after was excellent. We'll be booking again here for sure. It was our pleasure to have Sean and his family visit and to know they appreciated our condo and more importantly enjoyed what Bretton Woods had to offer. We look forward to their return. Wow! We felt very lucky to have found this great condo for Easter weekend. We were 2 families (4 adults and 3 kids) and had more than enough room. AND was reasonably priced. The condo is well-maintained and well-stocked with all the kitchen appliances / utensils you need, a great layout with the kitchen and bar into the living room and an incredible view of the mountain. One of our 3 days was total rain and we enjoyed spending the whole day in the condo! Can't say enough about what a great choice for the weekend! I don't think the photos on the website do this place justice! It was much bigger than we expected. The second family room on the bottom floor was an unexpected bonus and provided lots of room for our kids to play. There were 5 adults and 3 children in our group and we had more than enough room on each level. The condo was immaculate as well. The kitchens and bathrooms were very well kept and we were very comfortable using the owners pots/dishes/linens etc. The owner was also really easy to deal with and was easy to get a hold of before and after the trip. 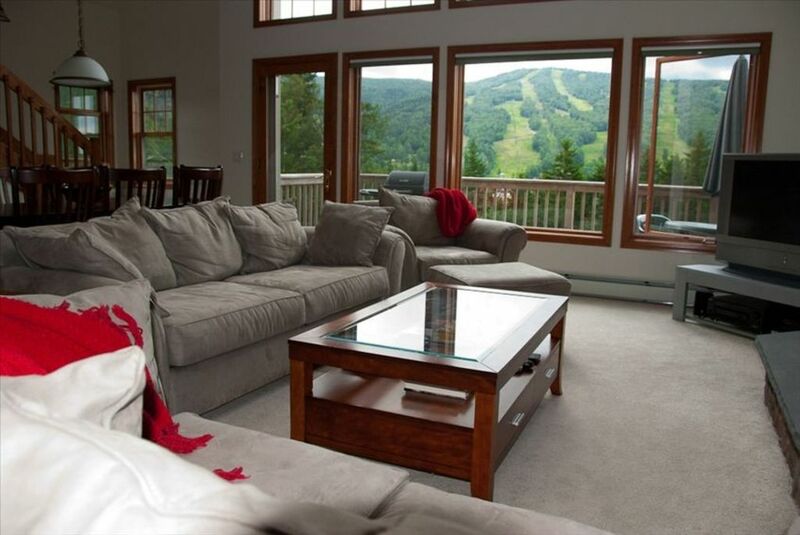 The best part of the condo is the clear view of the mountain from the family room. The three story window provides an amazing view of the ski resort during the day and night. We would definitely stay here again and recommend this condo to our friends and family.